A former Los Angeles County Sheriff's Department internal affairs commander, along with a captain, three lieutenants, and a sergeant, were the subjects of a previously undisclosed criminal conspiracy investigation related to the alleged abuse of inmates at a County jail in Castaic, NBC4 has learned from official documents and law enforcement sources. The case stemmed from an investigation that's resulted in criminal charges against three lower ranking Sheriff's employees, who were accused of inflicting cruel and unusual punishment on an inmate at the North County Correctional Facility on Sept. 5, 2014 while attempting to discover if the inmate was concealing contraband in a body cavity. The so-called "potty watch" case led to changes in Sheriff's policies prohibiting deputies from shackling inmates to walls, floors, or other fixed objects. 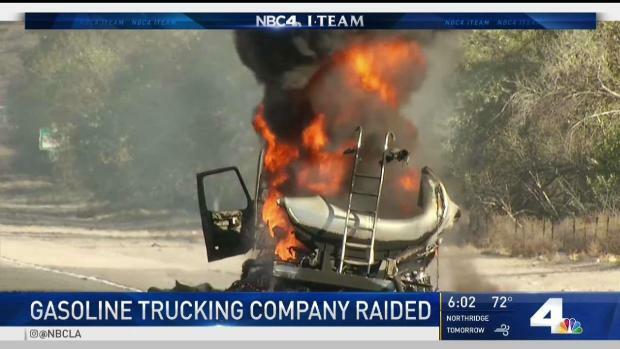 Federal agents have raided a gasoline trucking company in Corona that's been tied to two fatal explosions and other accidents. Eric Leonard reports for the NBC4 News at 6 on Wednesday, April 11, 2018. The high ranking officials, who were all at one time assigned to NCCF, were investigated under the theory they had created the policies, and had caused the installation of hardware inside special cells, that enabled the alleged abuse, a Sheriff's official who was not authorized to discuss the matter publicly told NBC4. One of the accused was promoted to commander and was placed in charge of all of the Sheriff's internal affairs units during the course of the investigation, according to a law enforcement document. "These incidents were discovered during a routine internal audit by command staff and we determined that they could have been handled better," the Sheriff's Department said in a written statement Thursday. "We immediately implemented new measures and policies to ensure it would not happen again. Department-wide, as we become aware of incidents that could have been managed differently, we train our personnel to be more effective, as well as modify our policies and procedures to better accomplish our mission." It is unknown whether that internal affairs case resulted in any discipline because of California's Peace Officer's Bill of Rights, which provides expanded privacy protection for police officers. The criminal case against the lower-ranking employees, including two sergeants and a deputy, alleged the three had "tethered" an inmate for many hours, causing injury. In March the Los Angeles County District Attorney's Office dropped the criminal charge against David Moser, one of the three, "in the interest of justice." The case against the two other men continues and they're expected in court in July for trial, the DA's office said this week. The Sheriff's Department has not yet confirmed to NBC4 whether the commander, captain, lieutenants, and sergeant named in the investigation are still employed by the Sheriff's Department and if so, at what rank and assignment. A letter from the Department said it could take another two weeks to provide that information.